Hello there, this is Workneh and I'm proud Ethiopian. I am looking for someone I can talk to, to share ideas, cultures even knowledge and since English is my second language to enhance my English way better. 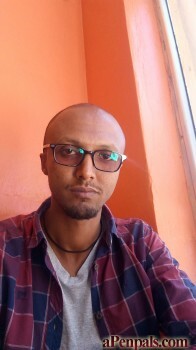 I'm an IT specialist working here in Ethiopia. I love to have fun. I would love to talk to anybody about anything he/she loves to talk. This can be talking about life, technology, philosophy, art, literature and another. I really wants to talk with an honest person.